The Apple of China, Xiaomi going to launch two world-class smartphone in affordable price to take on the biggies like Apple, Samsung and HTC. I am talking about the all new Xiaomi Mi5 and Xiaomi Redmi Note 2 which salted to launch on Wednesday, 2PM, 15th Jan. 2015. Xiaomi Mi5 expected to cost you Rs 20000 (1999 YUAN) and Xiaomi Redmi Note 2 at 499 Yuan ( Approx. ₹15000/$245) in White colour option. According to leaks, upcoming Xiaomi Redmi Note 2 will support Dual-SIM(GSM+WCDMA), 4GLTE, NFC, Wi-fI, Bluetooth come with a bigger 5.5-inch Full HD display with 1080p resolution and Glass-film-film (GFF) architecture powered by a powerful 64 bit-Snapdragon 615, Eight core Soc processor and run on Android 5.0 Lollipop OS for superior user interference and blazing multi-tasking. Xiaomi Redmi Note 2 will sport a powerful 16-MP rear camera with f/2.2 aperture and dual-LED flash and Sony CMOS sensors for shooting and 8-MP rear camera for video calling and selfies will powered by a powerful 35,00mAh battery. According to leaked specifications, Xiaomi Mi5 will support Dual-SIM with Dual-Mode(GSM+WCDMA), 4G LTE, 3G, NFC, Wi-Fi, Bluetooth, USB and GPS offers you a 5.7”-inch full-HD LCD display with resolution (1080×1920 pixels) will run on most advance Android Lollipop OS dubbed MIUI version 6 powered by a Eight-core processor, 64-bit computing ability with 3GB RAM, 16GB internal memory expandable up to 128GB via MicroSD card. Mi5 will sport a huge 20.7-MP rear camera with dual-LED flash with Sony CMOS Sensor and 8-MP front facing camera expected to be packed with a powerful 3500mAh Li-ion battery with battery stamina Mode including innovative features like heart rate monitor and fingerprint sensor. 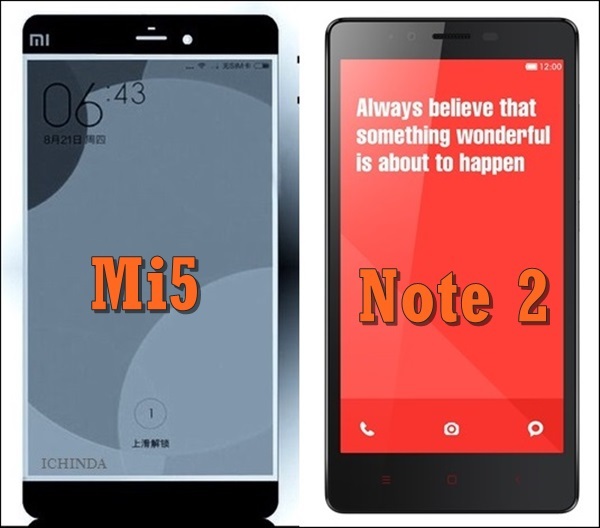 At last few honest word, the all new Xiaomi Redmi Note 2 and Xiaomi Mi5 coming to rule the smartphone market. What you think? Please be open to give your view. I want to purchase mi5.. I will be purchased xiaomi Mi5.